We have our headquarters in one of the most famous medieval towns in Europe. Rothenburg ob der Tauber gets all of the attention and the tourists, at least the foreign ones, who come three million strong per year to wander its cobble stoned streets and gaze at this town frozen in time. For Germans, the former free imperial city of Dinkelsbuehl, located just half an hour south of Rothenburg, has much of the same charms as Rothenburg while maintaining a more authentic atmosphere. Instead of souvenir shop after souvenir shop, there are actual businesses up and down the main and side streets of this walled fantasy town. What many who visit Rothenburg don’t realize is that a third of it was bombed out during the closing weeks of World War II. Dinkelsbuehl totally escaped any destruction during that war and so, remains one hundred percent intact. In 1811 a wealthy citizen purchased the old wall complex on the western side of the city and turned it into a garden promenade. 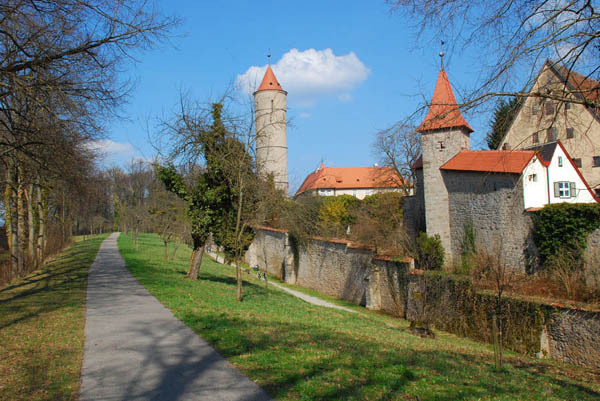 To wander along the path following the ancient wall on the west and southwestern side of the city is to see twelve remarkably well-preserved towers, towers that inspired painters around the year 1900 to include this town on their “Romantic Route” through the heart of Germany. Today, this is known as the “Romantische Strasse,” and it passes from town to town, city to city, from Wuerzburg in the north to Fuessen in the Alps far to the south, where King Ludwig built his fairytale Neuschwanstein Castle. 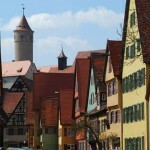 Dinkelsbuehl has a similar history to Rothenburg. Built as a stopping point on a well-traveled medieval trade route, it grew in power and influence over the centuries, eventually becoming a city-state answering only to the emperor himself. Riches flowed from its position on the trade route, various taxes imposed on traders and travelers and a booming hospitality trade. Plus, it had thousands of acres of farmland producing everything from grains to wool for its textile industry and along with that, the dyes for which it became famous and even wealthier. With all of this money, the townspeople of the town built immense monuments to their success, St. Georg’s Church one of those. The church seems to be out of scale to the town around it, but hey, in the days before buying a Mercedes to show your wealth and position, building a big church was the next best thing. At least it could be seen from far away and served for hundreds of years as a watchman’s post and home to safeguard the town from fires at night and invaders at any time of the day. 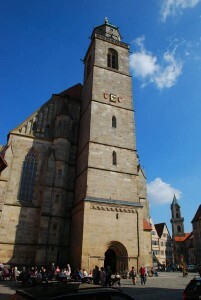 The church of St. Georg has beginnings in the 12th century. It was finally finished around 1616. 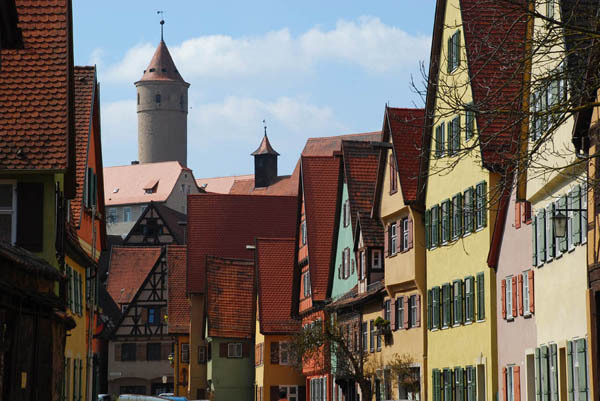 Another difference between Dinkelsbuehl and Rothenburg is the cost of everything from a cup of coffee (at least a third less than Rothenburg) to a full meal, costing a good three to four Euros per plate less than its more famous big brother. 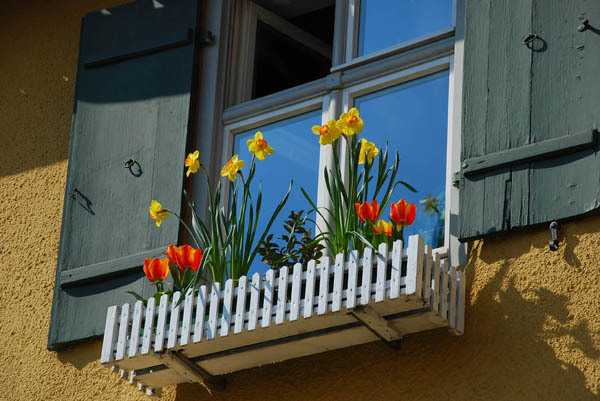 Lodging costs are lower, too, with bed and breakfast at least 25% under what Rothenburg’s innkeepers charge. Could it be that Rothenburg is more famous just because it’s closer to the autobahn, and therefore, an easier stop for tour buses? As a citizen of Rothenburg, I have to say my allegiance lies with it, just as in the old days when a citizen of Rothenburg would have a kind of passport, which protected him as he traveled around the empire. But as a tourist, I have to vote for the lesser-known Dinkelsbuehl as the most pleasant place to spend a lovely afternoon in the springtime. Visit Dinkelsbuehl and other towns which are off the beaten North American tourist path on a private tour with European Focus. See more images of Dinkelsbuehl by going to our Picasa Web Album. 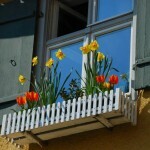 Posted in Germany Tours, New Discoveries and tagged bavaria, dinkelsbuehl, dinkelsbuhl, franconia, germany, road, romantic.